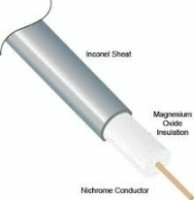 Raychem HIQ mineral insulated (MI) Inconel 600 series heating cables are suited for use in hazardous areas. The Inconel 600 sheath offers excellent corrosive properties against a wide range of organic acids and alkalis, as well as chloride stress-corrosion cracking, in combination with a high temperature withstand capability. HIQ cables are typically used in bitumen plants, gas plants, oil refineries, reactors and vessels, sodium loops and a wide variety of other heat-tracing applications where temperature resistance, power output and durability are required and exceed the limitations of stainless steel sheathed MI heating cables. The heating cables can be used for exposure temperatures up to 700°C and a typical power output up to 300 W/m. Higher temperatures and power outputs can be achieved, contact Pentair for assistance. The heating cables are offered as bulk cables as well as factory-terminated heating units employing brazing or laser welding techniques to ensure optimum quality of the connections. The offering is completed with a full range of components for installation, connection and splicing of the heating cables.